Mayor Megan Barry signed Executive Order No. 40 on Urban Forestry today on Belmont’s campus — an order that recognizes trees as a public utility, establishes new guidelines to govern Metro’s planning and maintenance of trees and appoints a new Urban Forestry Program Manager to lead and coordinate all Metro tree-related activities. Many key Metro individuals were in attendance at the event including District Councilmember Burkley Allen, Metro’s new Urban Forestry Program Manager Naomi Rotramel and appointed members of both Mayor Barry’s Livable Nashville Committee and the Metro Tree Advisory Committee. 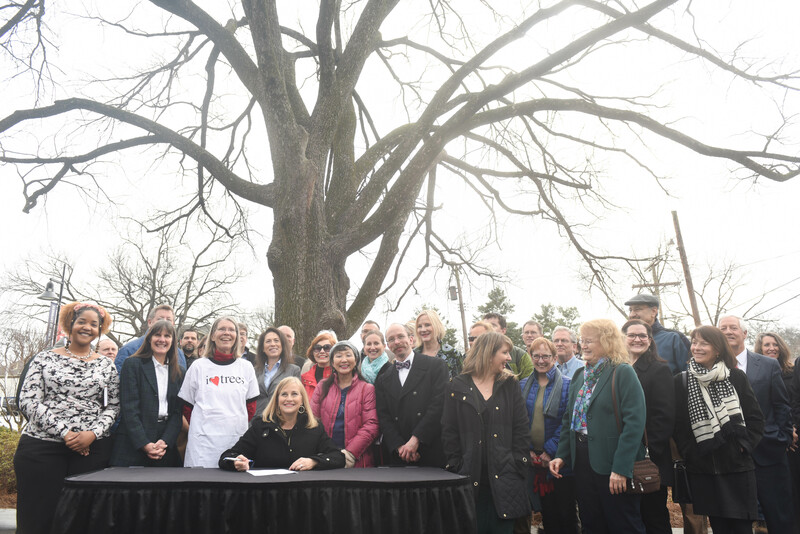 The event occurred just outside The Belmont Store, the University’s newly opened campus store, as Belmont went to great lengths to both protect and enhance the survival of a 60-70′ historic elm tree on its property. It is the University’s policy to work to preserve existing trees during any construction-related activities on campus. The Livable Nashville sustainability plan has set an umbrella goal of 50 percent countrywide tree-canopy coverage by the year 2050, an approximate addition of 300,000 net new trees planted by 2030, or 500,000 net new trees by 2050. This executive order seeks to help Nashville achieve its long-term sustainability goals: protecting air and water quality, improving public health, and saving public dollars on heavy infrastructure to mitigate stormwater impacts.